The laws of physics are inviolable. The principle of conservation of energy decrees the impossibility of ever constructing a perpetuum mobile. And in order to measure time to the nearest 1/1,000th of a second, a mechanical watch must have a balance that completes 3.6 million semi-oscillations per hour, i.e. its frequency must be 500 hertz. But such laws, it seems, are binding only in the three-dimensional world. They’re invalidated when we move into the fourth dimension: time. How else would it be possible for Montblanc to unveil at the Salon International de la Haute Horlogerie in January 2012 a wristwatch chronograph that can measure elapsed intervals to the nearest 1/1,000th of a second, yet has a balance which oscillates at a pace of only 50 hertz? Montblanc’s master watchmakers in Villeret have achieved a remarkable feat with the TimeWriter II Chronographe Bi-Fréquence 1,000. One is tempted to describe it as a triumph of mind over matter when this fifty-hertz chronograph is halted after measuring an elapsed interval and shows the span’s duration with 1/1,000th-of-a-second precision at first glance. This watch was created in the context of the TimeWriter concept, which inspires the “Fondation Minerva” (that Montblanc founded in 2008) to create timepieces at two-year intervals which advance the great tradition of the authentic Swiss art of watchmaking towards its even greater future. Each timepiece constructed in the context of this project is a genuine innovation that embodies an entirely new idea but always transforms that concept into tangible reality through reliance on tradition. Furthermore, each such watch demands both broad-based horological expertise and the highest degree of craftsmanly skill. 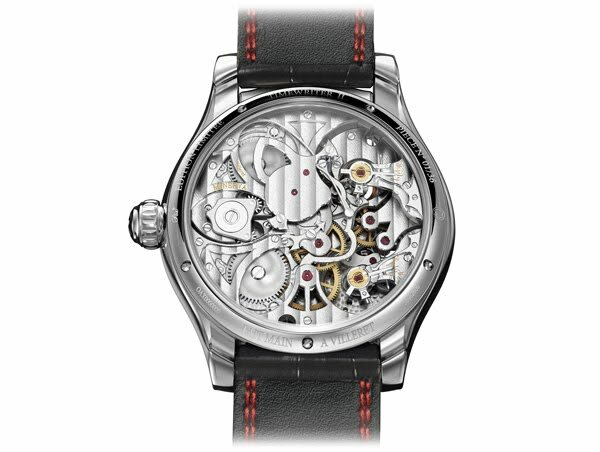 This was already most beautifully illustrated in 2010 by the Montblanc TimeWriter I Metamorphosis: a chronograph equipped with a filigree mechanism on the dial, activated by a lateral cursor that sets into motion a transformation of the dial from the function and characteristic of a sportily dynamic chronograph to the visage of a classically elegant watch and vice versa. The TimeWriter project also endeavors to support talented and highly promising watchmakers. In accord with this philosophy, the TimeWriter II was realized by the Hispano- Swiss watchmaker Bartomeu Gomila at Montblanc’s ateliers in Villeret under the aegis of master watchmaker Demetrio Cabiddu. Born on the Balearic island of Menorca, Bartomeu Gomila completed his training at WOSTEP in the category of “restoration and complicated timepieces” and is the first Spanish citizen to have earned a diploma from this renowned institution of higher learning. Recognized by the Swiss state, WOSTEP (Watchmakers of Switzerland Training and Educational Program) is an independent institution that’s jointly supported by businesses in the Swiss watchmaking industry, international watchmakers’ associations and watch dealerships around the world. As a continuing-education institution, its prospective students must prove that they have completed their training as watchmakers and have gained several years of professional experience in their métier. The widely diverse courses taught at WOSTEP include an introduction to the Swiss lever escapement, precision time measurement, and the functions of watches with “grandes complications”. A certificate from WOSTEP is recognized worldwide as one of the highest educational qualifications for watchmakers. After completing his course of studies, Gomilla restored historical timepieces from renowned brands and most recently worked as a freelance restorer of historical timepieces for international collectors. Readers who would like to learn more about Bartomeu Gomila are welcome to visit his website at www.tallerdeltemps.es. Founded in 1858, the Minerva manufacture was completely integrated into Montblanc as the brand’s haute horlogerie manufacture in 2008. For more than a century, Minerva has ranked among the most famous, limited suppliers of high-quality instruments for measuring brief intervals of time with an outstanding precision. This is true both for watches which combine a display of the ordinary time and a stopwatch function (now generally termed “chronographs”), as well as for classical stopwatches, which serve only to measure brief elapsed intervals. Minerva was among the first to debut a mechanical stopwatch with 1/100th-of-a-second accuracy. This stopwatch, which appeared around 1916 and was redeveloped in 1936, has a large chronograph-hand that completes one full circle every second. Nearly a century later, this timepiece would serve as an inspiration when Montblanc’s watchmakers began the project of realizing the Montblanc TimeWriter II Chronographe Bi-Fréquence 1,000. A first glance this superlative Montblanc chronograph raises the question: “Where are the chronograph’s buttons?” As an authentic monopusher, this watch has only one button. In homage to the ultrafast stopwatches presented by Minerva in 1936, which were included in the Guinness Book of Records, this lone button is positioned at “12 o’clock” and exactly midway between the horns, where none but chronographic initiates are likely to see it and comprehend its purpose. Beneath this button stretches a dial that promises complicated mechanical timekeeping in its purest form. This multilayered sculpture presents various functions on different levels. This description may sound complex, but the practical result is good and provides unmistakable legibility. The ordinary time of day or night is indicated by an hour-hand and a minute-hand at the center of the dial; a rotating disc of sapphire crystal collaborates with an immobile triangular index to track the continually running seconds at “9 o’clock”: both of these displays keep time accurately thanks to a large screw balance which swings at the traditional pace of 18,000 hourly semi-oscillations (2.5 Hz) and is readily visible through the partially skeletonized dial at “7 o’clock.” All other indicators serve the chronograph function, to which this exclusive timepiece devotes the highest priority. The chronograph’s little balance can be seen at “half past ten”: when this speed demon is switched on, it oscillates at a rate of 360,000 A/h (50 Hz). These vibrations are so fast that they can no longer be seen by an unaided eye: only a quiet purr can be heard, not unlike the sound of a well-lubricated Singer sewing machine. The chronograph’s indicators begin with a red, centrally axial, elapsed-seconds hand: it completes one full 360° rotation every second so that its tip sprints along the hundredths-of-a-second scale on the dial’s periphery. A double counter at “6 o’clock” has a longer, red-tipped hand tip to tally elapsed seconds from one to sixty, as well as shorter, all-red hand to count a maximum of fifteen elapsed minutes. A slightly inset cartouche at “3 o’clock” indicates the remaining reserve of power for the chronograph’s movement which, when fully wound, will suffice for more than forty-five minutes. The power-reserve display also serves as a helpful indicator for the chronograph because it shows how much longer the chronograph will continue to run beyond the fifteen elapsed minutes it can tally. But the unchallenged pièce de résistance tops the dial at “12 o’clock,” where another cartouche boasts a little triangular arrowhead that runs along an arcing scale calibrated from N (for “neutral”) through zero, and thence to nine-thousandths of a second. When an elapsing interval is being measured, the chronograph’s elapsed-seconds hand (the trotteuse) orbits the entire dial once per second. But rather than occurring as a smooth progression, this circular motion is subdivided into 100 individual steps which the naked eye cannot distinguish from one another, just as the twenty-five motionless photos that succeed each other in each second of a classical film are perceived as a seamlessly flowing motion picture. The chronograph’s center-wheel, to which the central chronograph hand is affixed, likewise jumps from one tiny step to the next in hundredth-of-a-second increments. Thousandths of a second are measured in an entirely different way. The Spanish watchmaker Bartomeu Gomila was inspired by a childhood memory: as a boy on the island of Menorca, Bartomeu loved to play with a big wooden hoop, which he would roll along the beach either by repeatedly pushing it with his hand or striking it with a little stick. He soon realized that he could keep the hoop rolling in a uniform rotary motion if he continually gave it equally strong impulses at equally timed intervals. Decades later, this phenomenon would point him on the path toward an ingenious method for measuring thousandths of a second. For nearly a century, the watchmakers at the Montblanc manufacture in Villeret had already known how to make a mechanical watch that could measure hundredths of a second. The secret was a balance with a frequency of 50 hertz (360,000 A/h). This rapid oscillator completes 100 to-and-from motions per second, i.e. 50 times in one direction and 50 times in the other. 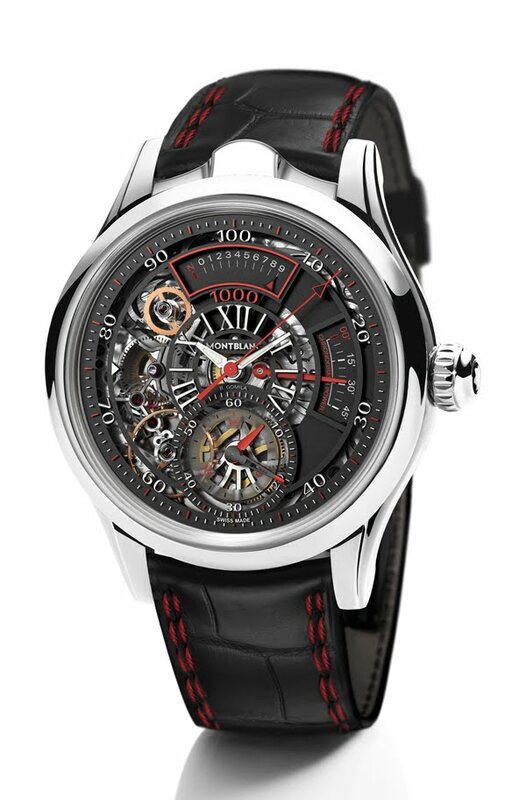 This tempo not only guides the motion of the trotteuse in the Montblanc TimeWriter II Chronographe Bi-Fréquence 1,000, it also sets the pace for delivering an impulse of energy that sets into rotation an innovative wheel in the gear-train, the so-called “thousandths wheel” (mobile de millième). Powered in this fashion, it rotates around its own axis at a uniform speed of ten rotations per second and thus provides the resolution with which hundredths of a second can be further subdivided into sets of ten increments. The chronograph function is controlled by a two-level column-wheel: one level guides the start, stop and zero-return functions; the other level controls the thousandths wheel. This solution offers enormous advantages which make it far superior to every conventional mechanism that has ever been used to measure thousandths of seconds with the aid of a 500- hertz oscillating body. 1. A frequency of just 50 hertz generates considerably less friction and drastically reduces wear. 2. The Montblanc TimeWriter II Chronographe Bi-Fréquence 1,000 amasses a power reserve for measuring brief intervals that is several times larger: it suffices for 45 minutes, but it can be continually lengthened by periodic manual winding. 3. The long-lasting power reserve also contributes to the regularity of the amplitude of the hundredths-of-a-second balance which, in turn, enhances the precision of the time measuring – a decisive advantage for accurately measuring intervals to the nearest thousandth of a second. 4. Reading the elapsed time is very simple because it follows the familiar pattern used on ordinary chronographs. The thousandths of a second are displayed on a cartouche at “12 o’clock,” where a triangular red pointer progresses along a scale calibrated from 0 to 9. The resting position is indicated by the lettered “N” (for neutral), leaving the 0 to unambiguously indicate zero thousandths, i.e. one full one-hundredth of a second. 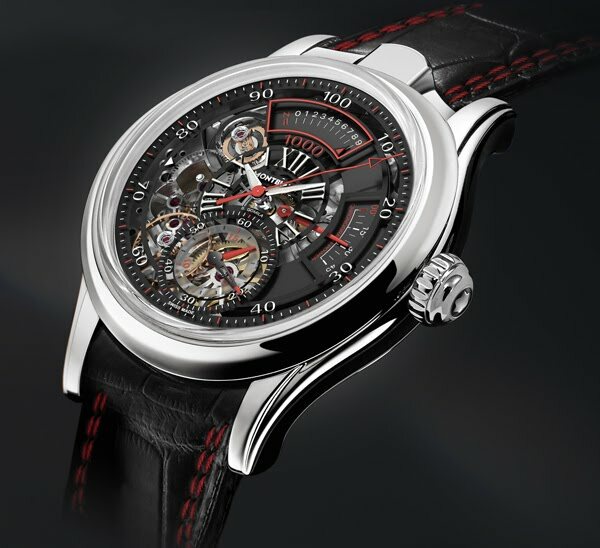 A comprehensive package consisting of two main patents and twenty-two auxiliary patents protects the principle and the technology for this timekeeper, which is designed to measure brief intervals with resolution to the nearest thousandth of a second. The mainspring for the ordinary timekeeping movement is wound by turning the crown clockwise (the power reserve is about 100 hours). Turning the crown counterclockwise tenses the separate mainspring for the chronograph’s movement, which delivers optimal measuring results for more than forty-five consecutive minutes. To tally lengthier intervals, power can be conveyed to the chronograph’s barrel by turning the crown while the chronograph is running. Pressing the button between the horns at “12 o’clock” starts the chronograph: the long red trotteuse begins to race once per second around the main dial, twin counters at “6 o’clock” tally its rotations, the little red hand on the chronograph’s power-reserve display gradually progresses upwards, and the 1,000th-of-a-second arrowhead at “12 o’clock” points motionlessly toward the “N”. When the chronograph button is pressed again, the entire system instantly halts and the duration of the elapsed interval can be read: beginning with the number of elapsed minutes on the inner scale on the twin counter at “6 o’clock,” followed by the elapsed seconds on the outer scale of the same subdial, continuing with the hundredths of a second on the peripheral scale surrounding the main dial, and culminating with the thousandths of a second in the cartouche at “12 o’clock.” The entire process is simple, clear, quick and requires no additional calculations. This ingenious principle for measuring extremely brief intervals of time has been registered for patent protection. well as a light and readily palpable pressure point to facilitate extremely exact measurements of very short intervals. The wristwatch is affixed to a black alligator-skin band with a pronged buckle made of white gold. A double row of red stitches adds an attractively sporty accent to the strap. The nearly quadratic reptilian scales prove that leather from the costliest part of the animal’s skin has been used. Needless to say, the case has a screwed back with a pane of sapphire crystal, through which the watch’s owner can gaze to admire the exclusive mechanisms of this superlative chronograph and the elaborate, manually executed finishing on its individual components. The Montblanc TimeWriter II Chronographe Bi-Fréquence 1,000 will be manufactured in a limited edition of thirty-six watches, so it will forever remain a rare pleasure. Thirty-six was chosen for the number of watches as an homage to the year 1936, when Minerva built the ultra-fast stopwatch that earned a mention in the Guinness Book of Records.